A Repeated Unrepeatable Journey explores a ploughed field where the collection of raw and various materials are gathered. Raw materials that link the surface to the lands natural geology but also materials manipulated or brought to the field by man-made processes. Some of these materials are on display but others are ground to make earth pigments and used to capture the movement and changes in a journey. A journey of liquid slowly flowing across a surface and changing its course making resemblances to a river or the changes and movement over time in a landscape but here only for a limited and calculated time. A series of five journeys have been captured which are timed for the same length of time to put emphasise on the idea that no one-hour can be the same or repeating an unrepeatable journey. Clay, sandstone, limestone, ironstone, marlstone, slate, brick and pieces of terracotta tile found in the landscape are ground to dust and sprinkled into water. 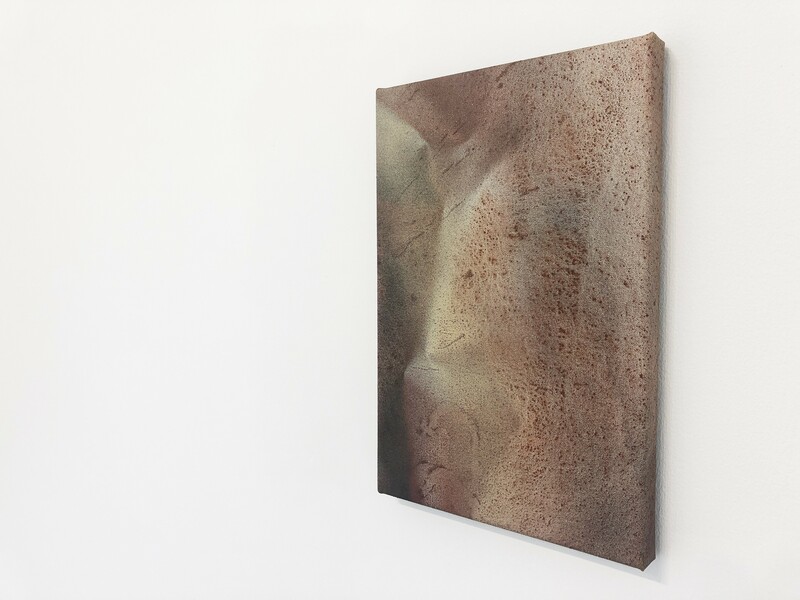 The gathering of these materials represents a displacement and a glimpse of a much greater sense of time.References are made to geological time and the changes in the shapes of the landscape through natural and man-made processes. The resulting overall shapes can also reference organic forms and growths that are created in conjunction with liquid. Scale is abandoned to the imagination but at the same time there is an immediate presence of the physical material. Gail studied Painting at the Royal College of Art and has exhibited widely nationally and internationally.